We’d love your help. 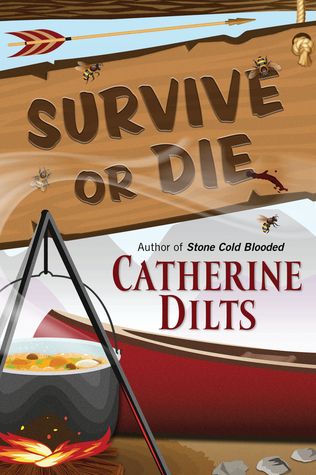 Let us know what’s wrong with this preview of Survive or Die by Catherine Dilts. Peace Corps. But you’ll be laughing as you go. You think you’re gonna Survive, but you’re gonna Die. Die. Die. To ask other readers questions about Survive or Die, please sign up. The employees of Bender Clips are going on a corporate retreat. Jack Bender, the owner, has shut things down for a week and rented out the Survive or Die camp in the Colorado mountains. The camp was used as the location for a reality TV show of the same name a decade ago, and the host is still basking off the fame that show brought him. Jack has a surprise for his employees. The winner of the week will get a raise, and the loser will get fired. Leave early? You might be fired as well. The employ The employees of Bender Clips are going on a corporate retreat. Jack Bender, the owner, has shut things down for a week and rented out the Survive or Die camp in the Colorado mountains. The camp was used as the location for a reality TV show of the same name a decade ago, and the host is still basking off the fame that show brought him. Jack has a surprise for his employees. The winner of the week will get a raise, and the loser will get fired. Leave early? You might be fired as well. The employees, and a few spouses tagging along, are less than enthusiastic at this turn. And some of the employees have their own agendas for the week that go beyond the challenges. Before things get too far, a small group of employees find a death threat left on Jack Bender’s car. The first night, someone dies, only it isn’t Jack. Was it a tragic accident? Is there a killer at camp? Who will win the raise? Or will accidents befall more people? This is a creative book. The plot is as much about the competition as the murder, and I got caught up in both stories. One part of the climax turned things darker than I was expecting, but overall, I enjoyed the book and everything is explained by the end. While we have a core number of characters, there are a lot of them, and I had trouble keeping them all straight at times. Fortunately, we usually got the needed context when someone entered a scene. The core characters are well developed, and we get some nice growth in most of them. There is subtle humor aimed at corporate life in the book; as a corporate employee during the day, I found it fun while hitting too close to home. Catherine Dilts is the author of the Rock Shop Mystery series, while her short stories appear regularly in Alfred Hitchcock Mystery Magazine. With a day job as an environmental regulatory technician, Catherine's stories often have environmental or factory-based themes. Others reflect her love of the Colorado mountains. Her short story Do-Over appears in the 2018 anthology Blood and Gasoline. She t Catherine Dilts is the author of the Rock Shop Mystery series, while her short stories appear regularly in Alfred Hitchcock Mystery Magazine. With a day job as an environmental regulatory technician, Catherine's stories often have environmental or factory-based themes. Others reflect her love of the Colorado mountains. Her short story Do-Over appears in the 2018 anthology Blood and Gasoline. She takes a turn in the multi-author sweet cozy mystery series Secrets of the Castleton Manor Library with Ink or Swim.